As a new blogger, it's important to me to get people to see that I even have a blog if I expect them to read it. Of course, you can manually post a Facebook or LinkedIn status update every time you write a new post, or you can let the internet do some of the work for you! Here's a few steps I've taken toward helping my blog get noticed. 1. StumbleUpon-Add your site to StumbleUpon. To do this, you need to have an account, but you should have one anyway if you like finding new things on the internet without much hassle. StumbleUpon allows you to choose interests (there are hundreds) and receive pages in a snap that you can then "like", "dislike", and share with other Stumblers or friends by email. You will be shown more pages similar to ones you like, less pages similar to the ones you don't, and you can review your favorites at anytime. If you have ever wanted to know all about a subject without having to search for anything, this is the site for you! Right above the "Explore an interest" box you'll see your username, which if you hover over, will show an option to "Add a Page". Just fill out the web address with the URL of your blog, fill out the rest of the fields, and click Add This Page. Now people will Stumble across your page if they have the interest you picked added to their profile. 2. 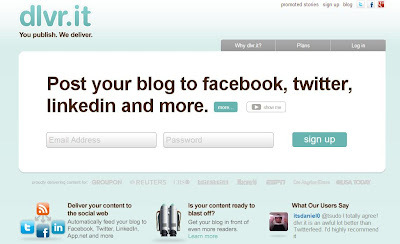 Dlvr.it- Dlvr.it is a really great auto-post tool that lets you link your blog to your social media profiles. First, sign up using your email address and create a password. 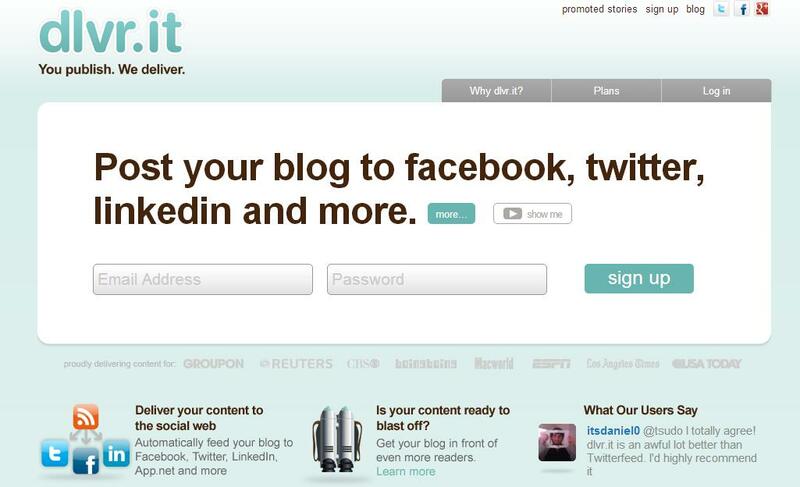 The site will then direct you to add your blog URL and allow it to access whichever social media sites you choose. The free version lets you have 5 feeds, 3 social profiles, and 30 minute feed updates. You can also check your stats on here just like on Blogger! 3. Change how your blog shows up in search results by making them come up POST TITLE FIRST. I learned that many blogs get lost in search results because the interesting, creative, and personal blog titles that we pick aren't usually the most searched terms. I found a cool trick online at Blogger Journey that changes the order in which your titles appear on search engines like Google. It only involves changing a few lines of code in your Blogger template, and if you follow the instructions on the page, it's really easy to do! 5. Comment thoughtfully on other blogs. You can mention the link to your blog in your comment IF you've said something thoughtful about their post first. If you use any of their content in your posts, credit them by mentioning it in the comment on their page, the post on your blog itself, and link back to their blog. You can also add them to a Favorite Blog List on your blog page. You never know when someone will return the favor and help you get more followers! There you have it. 5 easy ways to increase traffic to your blog. How do you get your content noticed? Share your methods by commenting below! Also, be sure to check out my post on How To Add a Creative Commons License to Your Blog!